We have been outside almost 8 hours of every day these past two weeks! Between gardening, cleaning up the yard, and just watching the boys ride bikes after a long winter, it's been early when we go out -- and late when we come in. My husband and I are very concerned about keeping our skin safe in the sun's rays so we always try to put sunscreen on the kids (and ourselves) before we head out. I haven't used the lip protector yet, but since this is an area that burns easily on my face, I should be giving it a try. Currently, my lip color has sunscreen in it, but on days when I go natural with my look, I'll have this in my purse for a quick swipe. You can learn all about the various offerings from this very family-friendly company at their website. Even if you have picky kids who are hard to track down, there is likely a product that will work for your sun protection needs! Wanna Win? 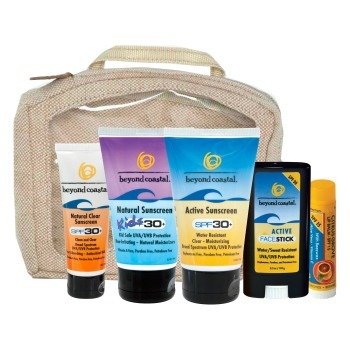 We are giving away a prize pack from Beyond Coastal! To be entered to win, just tell us what your favorite fun-in-the-sun activity is! You have until May 26th at 11:59 pm CST to get your entries in, and we'll pick one comment at random to win! (One entry per person, please.) This giveaway is open to U.S. residents ages 18+. See our full rules here.